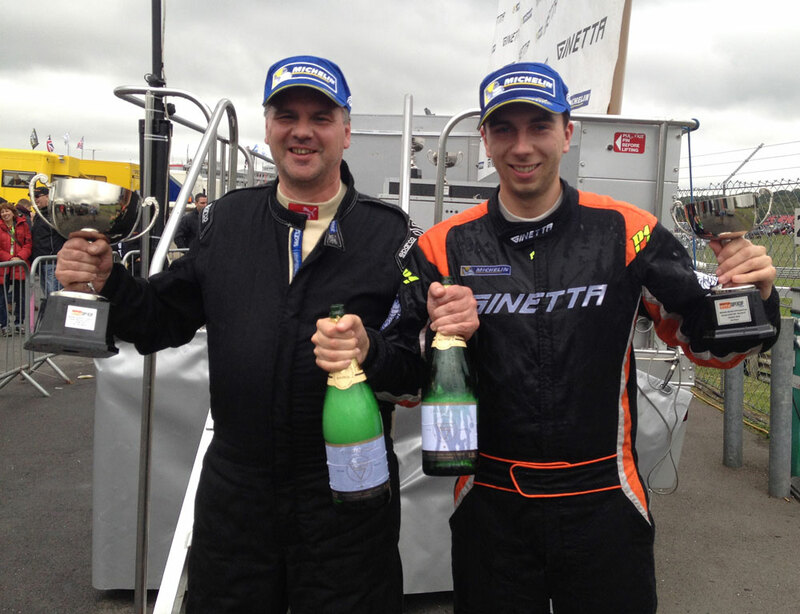 Century Motorsport have ended their 2014 Michelin Ginetta GT4 Supercup campaign with a quartet of podium visits on the final weekend of the season at Brands Hatch, with Tom Oliphant taking second overall in the final race of year while Steve Fresle picked up a hat-trick of class podiums on his Supercup debut. Fresle joined the Supercup grid for the first time having competed in three Britcar outings for the team this season, while Oliphant headed into the season finale hoping to add to his nine podium finishes so far to confirm his fifth place standing in the championship. After a positive day of testing on Friday, Oliphant was quick off the mark in Saturday’s qualifying to run a strong second until the red flags came out with eight minutes to go. While he eventually slipped back to fourth when the action restarted, the British GT4 race-winner was happy with his pace ahead of the opening race that afternoon. A frenetic opening couple of laps saw him sit in fifth heading into a short safety car period. Soon after the restart an unfortunate slide wide at Graham Hill Bend dropped him to eighth, but a tyre gamble to use scrubbed wet tyres paid dividends late on, allowing him to fight back to sixth. Starting in the same position for race two, Tom instantly gained a spot when a rival failed to make the grid and a good move on Declan Jones gave him fourth on lap three. Once again he came on strong in the latter stages of the race, but unfortunately he just ran out of laps before he could take a podium spot. That proved to be a blessing in disguise for the 24 year old though, with fourth giving him reverse grid pole for race three. While the final race unfortunately didn’t produce the season-ending victory he’d hoped for, a measured drive took him to third place, which became second post-race when David Pittard received a time penalty, his tenth podium finish of the year bringing his hugely impressive maiden full Supercup campaign to an end on a high. For Fresle, who entered the meeting with the aim of raising vital awareness and donations for his local charity Julia’s House Hospice in Dorset, the weekend provided a steep learning curve on his first outing in the category, but he took it in his stride to make huge steps forward over the course of the weekend in varying weather conditions. Qualifying eighteenth, Fresle enjoyed some great wheel-to-wheel racing in the opening race en-route to seventeenth overall and third in the championship’s AM class. Race two saw him move one step higher to take sixteenth outright and second in class, before his consistent and improving driving was rewarded with a great class victory and twelfth overall in race three.